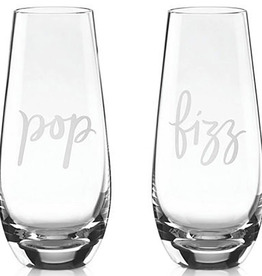 Our Hampton line is designed for those seeking thinner, lightweight stemware in which to present their favorite beverages. Its varietal-specific shapes will complement your every serving need. 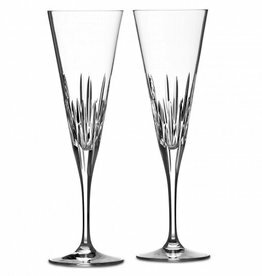 Hampton Champagne Flute - 6 Oz. Luxury meets tradition with the Duchesse collection by Vera Wang, characterized by a classic, elegant crystal with the minimum of decoration; limited to simple, but powerful designs that add just a touch of sparkle. 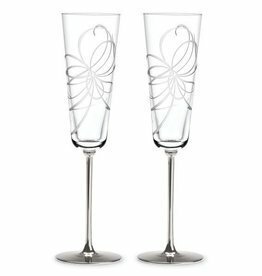 From your first toast through many celebrations to come, Gardner Street champagne flutes lend an air of romance to the occasion with their beautifully etched floral motif. Boxed for beautiful giving. Crafted to subtly shimmer like sunlight-dappled water, Juliska’s Carine flute becomes decadently brilliant when filled with bubbly. Cheers to milestone moments, sunsets, and good vintages. 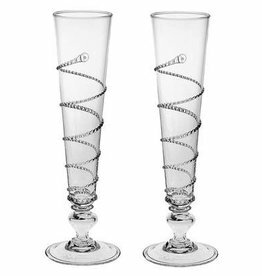 This sparkling set of quintessential entertaining glasses features a different signature motif for each hand-blown piece to create a foursome that is as handsome as it is unique. Stunning gift box! 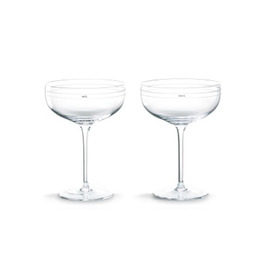 What a great wedding giift for a couple on trend with saucer champagne and hand made glass. 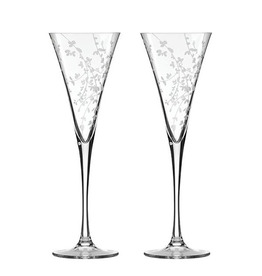 Tidy silver ties make this set perfect for that first toast - and many remembering the day. 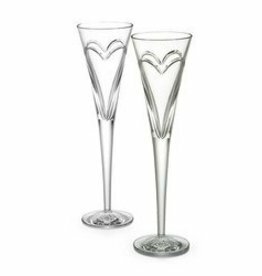 From Juliska's Amalia Collection - Stunningly statuesque, this pair of flutes is bedecked with a playful swirl that seems to ascend upwards to the heavens alongside your champagne bubbles.